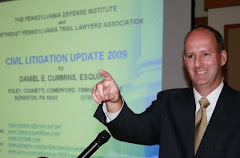 In what may be the beginning of the end of at least part of this travesty, Ex-Luzerne County Court of Common Pleas Judge Michael T. Conahan has again pled guilty to fraud charges in Federal Court on Thursday, April 29, 2010. His previous guilty plea agreement had been rejected by Federal Middle District Judge Edwin M. Kosik. According to an April 29th article by Terrie Morgan-Besecker in the Times Leader, Conahan signed a plea agreement under which he will plead guilty to a single count of racketeering conspiracy. All other charges in the 48 count indictment previously filed against the former judge, which included bribery, extortion, mail fraud, and honest services fraud, will be dismissed. According to an April 29th article in the Legal Intelligencer by Hank Grezlak and Leo Strupczewski, the racketeering conspiracy charge pled to carries a maximum penalty of 20 years in prison and a fine of up to $250,000. The article also noted that absent from the 21-page agreement is any minimum sentencing requirement or sentencing recommendation from the U.S. Attorney's Office. Instead, the agreement outlines that any sentence is to be "determined by the court." The plea deal does call for Conahan to forgo any opposition to a forfeiture action and to surrender his law license. Also absent from the written plea agreement is a cooperation clause. To date, it does not appear that Conahan will be testifying against fellow ex-Luzerne County Court of Common Pleas Judge Mark A. Ciavarella who has not pled guilty and who, through his attorney, maintains his innocence of the charges levied against him.